Boss Man’s note: SUP Racing is growing super fast in Europe, with hundreds of events throughout the year in pretty much every single country. And nowhere is it bigger than in France, home to many of the races and most of the leading paddlers in Europe. 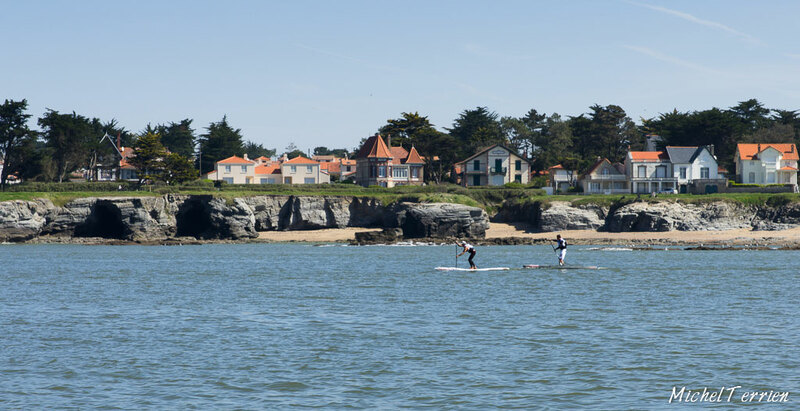 Next month we’ve got the big SUP Race Cup in St. Maxime, which kicks off six major weeks of SUP racing on the Continent, but in the meantime there are plenty of other races happening. 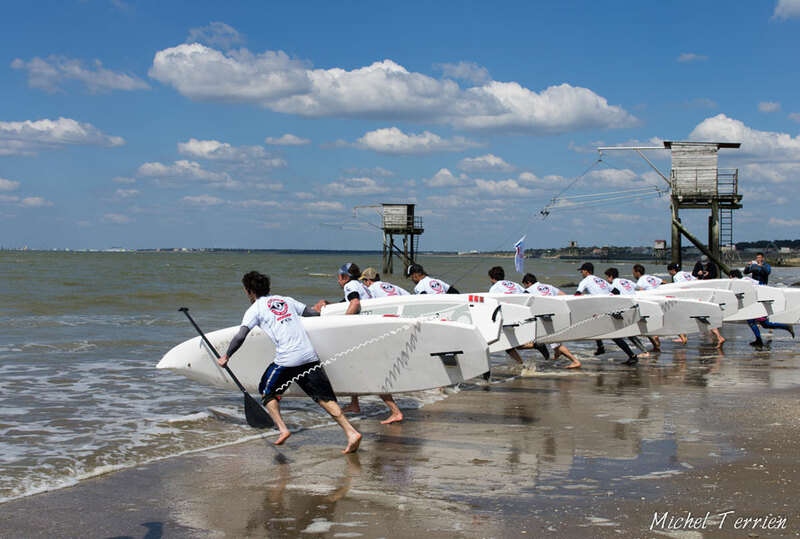 Last weekend it was the Jade Paddle Race in Brittany, an event organised by European #1 Eric Terrien’s family. As always there were plenty of keen paddlers on the start line, and, as always, Eric Terrien reigned supreme (though Gaetene Sene certainly put up a fight). 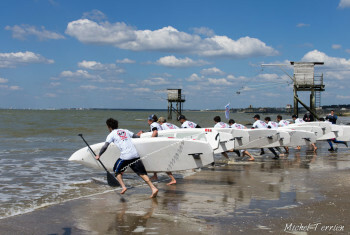 The South of Brittany (France, West coast) was the theater of this 3-star EuroSUPA event, with forty-six paddlers participating in the Long Distance Race. The course of this Elite Race (12’6) was delimited by the edge of the coast. The paddlers had to find the best way according to the wind and the waves.The orientation of the first three kilometers was upstream and upwind (light wind at this moment, a few knots), so most of the paddlers chose the option of staying very close to the cliff, taking advantage of some shelter. There was no danger for the paddlers, the ocean was rather calm, but they did have to be careful with their fins. After turning around the Pointe Saint-Gildas (the farthest western point of the course), the conditions changed for both the stream (from there it was downstream) as well as the wind (more or less downwind). The wind strengthened gradually, following perfectly the weather forecast, and in the last part of the course the racers benefited from good downwind conditions. Two racers took the lead very early on, Eric Terrien and Gaétan Séné. The gap between them and a group of five racers increased gradually, reaching about four minutes on the finish line. Regarding Gaétan and Eric, each one led according to the choice of his way among bumps, and also to a few falls. The last kilometer was decisive, the two paddlers accelerated and Eric finished first, twenty-four seconds before Gaétan. Four minutes later, Sébastien Gramont won the third place on the podium. Martin Letourneur was the first junior, with his eighth place in the Elite ranking. Thomas Hébert was the second junior and Martin Vitry took the third place in this ranking. Cécile Gondre was the fastest lady in this race, five minutes before Anne Crozet and ten minutes before Karine Dormet. 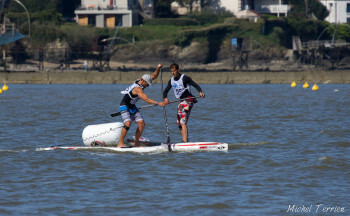 Then in the afternoon there was another important event, the first stage of the BIC SUP One Design 2013. Heats of twelve racers were organised, with quarters, semis and then a final. The juniors and the ladies held straight out finals. The racers appreciated these short sprints, having a lot of fun while competing for the win !